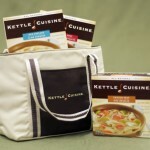 Kettle Cuisine – Food Blog Giveaways – Food Giveaways | Cook Eat Delicious! The Tomato Soup with Garden Vegetables is flavorful and super chunky. While the Roasted Vegetable soup is also flavorful, it brings more levels of taste to your palate by using real roasted veggies that you can taste with creamy texture from the puree of potatoes, leeks, carrots, and a hint of garlic.The all favorite though? The Chicken Chili with White Beans had to be the best. Very tasty. The chicken meat is very tender and adding some sour cream really brought out the flavor of the chili. The good folks at Kettle Cuisine don’t want me alone to try their soups, they want one of you as well! 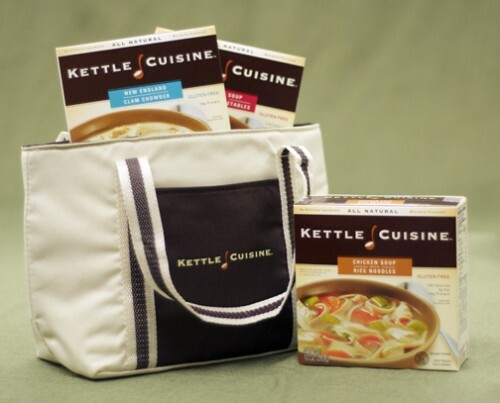 Kettle Cuisine is giving away a fancy cooler bag with 3 free coupons, notepad, informational brochure with extra coupons that you can give to friends and family! Enter the giveaway now by just leaving a comment on this post telling me your favorite type of soup! 1. Like me, CookEatDelicious.com, on Facebook and leave a separate comment on this post saying you have done so. 3. Follow me, @CkEatDelicious, on Twitter and leave a separate comment on this post saying you have done so. 5. Subscribe to CookEatDelicious (on the right hand sidebar) and leave a separate comment on this post saying you have done so. 6. Follow me, CkEatDelicious, on Pinterest and leave a separate comment on this post saying you have done so. 7. Like Kettle Cuisine on Facebook and leave a separate comment on this post saying you have done so. That is 9 chances to win! One comment will be randomly chosen on a number generator for the giveaway prize. 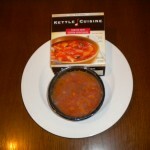 Thanks to Kettle Cuisine for providing the review and giveaway product. 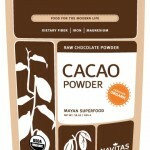 This giveaway runs until Tuesday, April 17th, 2012 so start commenting now! I would love to try the Chicken Chili with White Bean. I have made my own at home and it is one of my favorite soups. I am a fan of all soups really. I guess you could call me a soup lover! 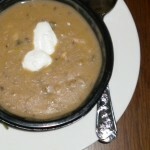 The Three Bean Chili looks really yummy!! I subscribed to Cook Eat Delicious. I commented on pinterest and on twitter and kettle cuisine’s page. I hope I did it right. Please let me know. Yup, just leave a separate comment for each entry you do, so one for FB, one for pinterest, one for twitter! Clam chowder is my favorite. Homemade chicken noodle and homemade vegetable and cream potato and tomato – hmm – can’t seem to pick just one! I love my homemade turkey and white bean chili in the winter. 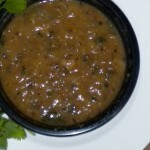 I also love Dr. McDougall’s black bean and lime soup-to-go. 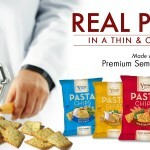 I liked Kettle Cuisine on facebook, too. What a fab range they offer. My favourite soup would probably be tomato, but I could really name so many flavours! BTW You are welcome to join in my monthly food blogger event THE SOUP KITCHEN, here all bloggers are welcome, hope to see you participate soon. Different theme each month. Theme for April is Chinese Soup. Homemade vegetable and cream soup would be my all-time favorite! 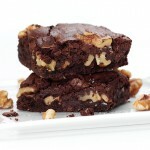 Following Cook Eat Delicious on Pinterest! I love any soup with substance….lots of veggies, or thick and hearty! 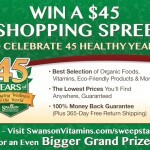 would love to win this gift package! My favorite soup is chicken enchilada. Three bean chili b.c chili with a salad sounds like a tasty but fast meal for the days we get home late! Shred some sharp cheddar cheese on top & some green onions & now we’re talking! Liked & commented on the Kettle FB! I love the Chicken Chili with White Bean when I can find it and afford to buy it. 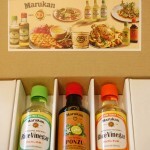 All varieties sound delicious – can’t wait to try them! Tomato soup is my favorite!! I love a creamy white clam chowder, but also a semi-chunky one with pieces of potatoes and clams (razor is the best)! also gonna post this freebie on fb! I posted on your fb! the giveaway looks great! you are awesome! !